A lot of folks, myself included, have old U.S. paper money and want to know what it’s worth. You’d be surprised what some paper currency is worth! Sometimes, bills that are old and unusual are worth little over face value, while others that look ordinary are rare and valuable. 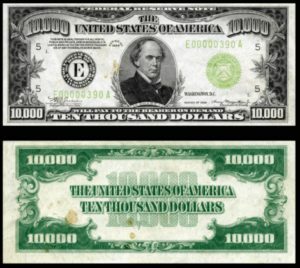 So, what is your U.S. paper currency worth? What Are Those Letters On Paper Money? The most common question people ask me about paper money has to do with those big letters on the fronts of our currency — you know, A, B, C, D, etc. What do those letters on paper money mean? The letter codes simply indicate which of the 12 U.S. Federal Reserve Banks printed a given note. They’re similar to mintmarks on coins. Serial numbers contain 8 numerical digits. The 1st letter preceding the serial number corresponds to the Federal Reserve Bank branch that printed the bill (A = Boston, B = New York, and so on). The 2nd letter refers to the number of times that serial number has been used, with A representing the 1st time, B the 2nd, and so on. The series year isn’t necessarily when the bill was printed, but rather the last time there was a change either to the design of the bill or when a new Secretary of the Treasury has been appointed. A suffix letter is added at the end of the series year to indicate a new treasurer of the United States. Figuring out what paper money is worth isn’t always easy. Knowing what your dollar bills and other paper currency are worth requires a basic working knowledge of the different types of U.S. currency and what collectors look for on their banknotes. 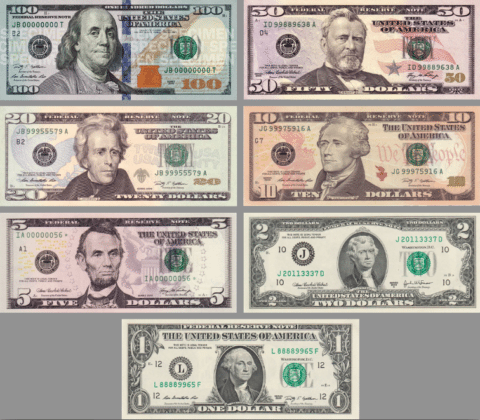 Small-size paper currency (issued since Series 1928) — Modern-sized paper money measures 6.14″ wide by 2.61″ and is about 25% smaller than their large-size predecessors. The most widely collected U.S. paper money includes Gold Certificates, Silver Certificates, and Federal Reserve Notes. The values of these banknotes depends on their condition. There are many, many banknotes that have been issued since the 19th century — far more than I could list in a single post here. But I’d like to cover the pieces I’m most frequently asked about. What you’ll find below is a basic rundown on the values of various Silver Certificates, Gold Certificates, and Federal Reserve Notes. 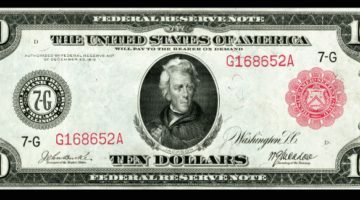 Generally speaking, most modern-era Federal Reserve Notes (or paper currency made since the last silver certificates were issued in 1964) is worth very little over face value. For example, worn examples of old dollar bills from Series 1969, Series 1974, or Series 1977 are worth $1.50 to $3. While paper currency made before the current series has some collector value, it’s normally only a few bucks over face, at best, if it’s worn. What’s A $2 Bill Worth? 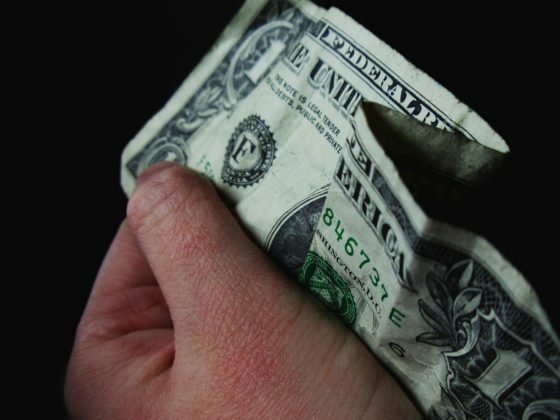 Many people think $2 bills are valuable. That’s reasonable — because $2 bills don’t widely circulate, so they’re hardly seen by many people. It seems most people have never seen a $2 bill. Believe it or not, most $2 bills that people encounter are common and, if they’re worn, are worth face value. For example, Series 1976 $2 bills (the type of $2 bill most often encountered) is worth $2. Other $2 bills — such as Series 1995, Atlanta Series 2003, Minneapolis Series 2009, and Series 2013 — are also worth face value if they’re worn. What About Red Seal Values? Many think that Red Seal and Star notes are worth more than face value. And they’re right. But what are Red Seal notes anyway? Why did the United States print paper currency with red seals? Do seals come in other colors? Some Red Seal notes are quite valuable. Take, for example, the 1928 $1 Red Seal note, which is worth $200 and up in circulated condition. Other worn Red Seals, such as the small-size Red Seal $5 bills from the 1920s through 1960s, are worth only $7 to $10. Yellow seals on gold certificates issued from 1929 through 1933 indicated the bill was redeemable for gold coins up to the face value of the note. Yellow seals are also seen on emergency-issue silver certificates issued between 1942 and 1945 for use by United States military forces stationed in North Africa and Europe during World War II. Yellow Seal $1 notes issued for World War II U.S. troops in North Africa are worth about $70 and up in circulated condition. Brown Seal notes are highly collectible. For example, Series 1935 Brown Seal $1 notes with “HAWAII” overprint are worth about $45 in circulated grades. While 1929 Brown $5 bills are worth about $60 in worn condition. Values for Red Seal, Brown Seal, and emergency-issue Yellow Seal paper currency varies widely — so it’s important to check with a paper currency price guide or paper currency dealer to get the specifics on your paper money. Are Star Notes Worth Anything? What Do They Even Mean? Some collectors have asked me about star notes. What are they? When inspectors at the U.S. Federal Bureau of Printing and Engraving find mistakes with certain pieces of money, they destroy the error notes and replace the notes with those of the same serial number but with an asterisk (*) after the serial number. The addition of the asterisk, or star, ensures that no 2 pieces of paper currency of the denomination in the series have the same serial number. This also helps the government keep track of how many bills have actually been printed. So, what are star notes worth? Given that only about 1% to 1.5% of paper currency consists of star notes, they’re relatively rare. Even modern star notes are worth more than face value. Consider, for the matter, worn Series 1981, 1985, 1988, and 1993 $1 star notes — which are worth $2.50 to $5 or more! Older star notes are worth a little more money. For example, Series 1957 $1 Silver Certificate star notes are worth $4 to $7, and Series 1935 $1 star notes are worth about $1o and up in worn condition. How Much Is Rare Confederate Money Worth? Let’s start off by saying this… The vast majority of Confederate paper money people encounter is fake. Best estimates suggest only 3% of the Confederate money that people find is actually authentic. Fake Confederate money is numismatically worth nothing. It probably goes without saying at this point that Confederate bills (real Confederate paper money, that is) are quite scarce. Perhaps surprising to some people, some Confederate paper money isn’t all that valuable. Some pieces are worth less than $100 in well worn condition, while others in nearly perfect condition go for thousands. How much is your Confederate money worth? That depends on whether or not the name of a certain bank is stamped on the bill, the condition of the paper currency, its date, and other variables. For this reason, it’s infeasible to provide a detail of Confederate money values here. I would encourage you to submit an image of your Confederate currency to a paper money dealer or upload the photos to paper currency dealers online to get information about your specific bill. What Are Fractional Notes? Are They Valuable? 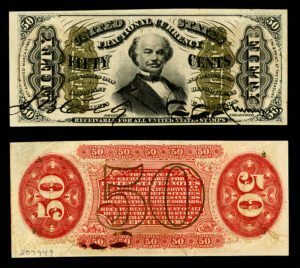 When the United States was experiencing the economically painful effects of the Civil War and coin shortages abounded, the government began issuing an array of paper currency with low face values under $1. These historic, often artful notes are widely collected by paper money enthusiasts. Those who want to buy Fractional Notes can do so for a relatively affordable price, too. Some circulated specimens of some Fractional Notes can be bought for about $20 and up.